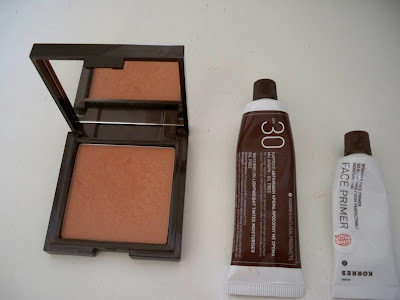 At the start of the summer, I went on a hunt in Sephora looking for THE perfect bronzer. I was happy with my Benefit bronzer, but it also came with a highlighter and there wasn't enough of the actual bronzer. I was also satisfied with my MAC MSF in Global Glow, but it was just a bit too shimmery for an all-over bronzer. I wanted something a bit more matte. Enter, the Korres trio I stumbled upon while practically giving up on finding what I was specifically looking for - I can be very picky when I have something dead set in my head! The Korres trio came with a powder bronzer, a tinted moisturizer with an SPF of 30, and also a face primer to keep your look from melting in the hot summer sun. The entire reason for the purchase was really just for the beautiful matte bronzer in Sunglow Light. It suits my somewhat olive, yet still somewhat light complexion. It is exactly what I had wanted. It has manoi oil in it, which makes my skin feel buttery and smooth. And it blends amazingly into the skin, instead of just sort of resting on top and making pores stand out like saucers ;) No one wants that! The Watermelon Tinted Moisturizer and the Vitamin E Face Primer were added bonuses, as the trio cost $28...which happens to be the normal amount for just the bronzer itself! I am so thrilled with all 3 Korres products. They all feel soft on the skin, and they all last throughout the day with no touchups. It can be difficult for me to find products that last, because I have combination skin - oily in the t zone, but dry around my cheeks. I found that these 3 products don't make me look extra oily or extra dry either, which is impressive. I am definitely looking forward to trying more products from this line. I was on Temptalia.com the other day, and guess what? Korres is having a 3o% off sale on their website now through Sept. 15th! Using the code, Temptalia, I decided to purchase the Korres starter kit. It comes with a sampling of many of their best-selling skincare products, such as the Guava Body Butter, and the Primrose eye cream. If you are interested in finding more information about the entire Korres line, I strongly suggest visiting their new website at Korres.com or checking out some great product reviews at Temptalia.com. The products are free of mineral oils, making them suitable for acne prone skin. Many of the products are also organic and feature ingredients that nourish, restore, and protect the skin. So far, I feel nothing but love for this line!